Take the description of the Wonderland 1999 Winter concert and slap it right here…with a few exceptions. Instead of a large, energetic show, you get the three DCT members by themselves in a much cozier, smaller stage type of concert. The concert is also slightly more ballad oriented which makes it a prime fit for Miwa’s sultry and powerful voice. The members get more involved with the audience and even invite a lucky winner on stage to get serenaded. 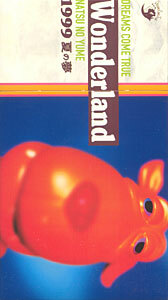 At slightly over two hours, Wonderland 1999 Summer is a excellent compliment to it’s wintery brother. I’d highly recommend getting both and enjoying DCT in both settings. The VHS version comes with a keychain of the cute creature featured on the cover.